KidLit411 is very excited to feature the amazingly talented, KELLY J. LIGHT in the Author-Illustrator Spotlight this week! 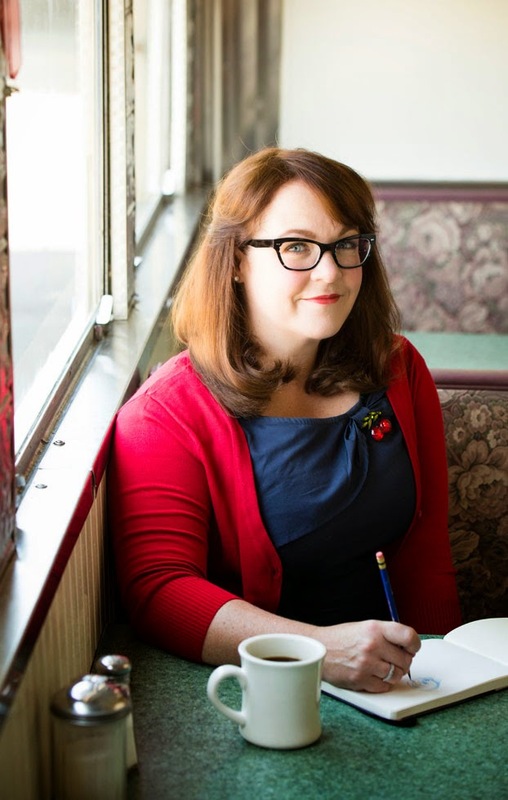 She is the author and illustrator of the picture book LOUISE LOVES ART which came out this week as well as the illustrator of the two chapter books series, THE QUIRKS and ELVIS AND THE UNDERDOGS, the upcoming DON'T BLINK by Amy Krouse Rosenthal and JUST ADD GLITTER by Angela DiTerlizzi. Welcome Kelly, thanks for joining us! I always knew I wanted to be a cartoonist. I never picked how I wanted to apply cartooning, be it newspaper comics, animation, book illustration or comic books. I thought it all fell under the "World of Illustration". . . so I went off to college and became an illustration major. I was surprised once I got there that I had a hard time with the professors about wanting to draw cartoons. I went into animation after college and on to character art for licensed characters with companies like Warner Bros and Disney. I decided to pursue children's books when I was 35 and wanted to get back to work after staying home with my daughter when she was young. I had a need to create my own characters and tell my own stories. I started to write "treatments" which are story summaries or outlines around 2006. I kept them in old 3 ring binders and filled up a lot over the next six years. I wouldn't do finished manuscripts. Just enough to launch me into drawing. I draw far more when developing a story than I write. I think on paper and drawing, or storyboarding helps me start a mini movie in my head. When the pictures start to feel right, I start having a running narrator and dialogue in my head. Then when the pictures are telling most of the story, I finally commit to the fewest words that are needed that add that missing element to the image. Do you have a favorite book that you've worked on? 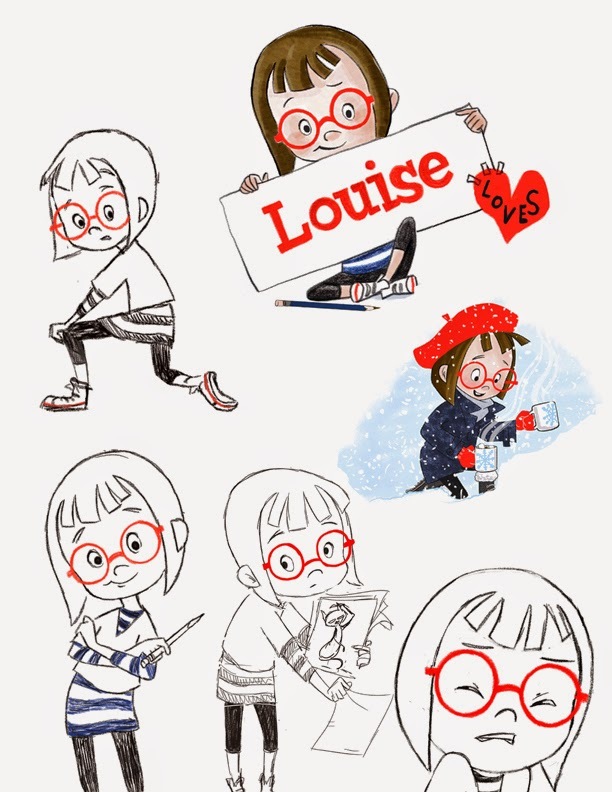 Could you tell us a little about your process for LOUISE LOVES ART? Did you start with a drawing or a concept? It's this book, LOUISE LOVES ART. It's because of who the character is and the reaction she gets from kids. I always start with character. For me, I have to cast the roles before I know what is going to happen. I draw the character a lot in every pose and emotion I can. I get to know the character so I know how they will act and look in the story. I think it's very different. When I get a manuscript to illustrate, I can relax into the words and images more. It feels like a puzzle handed to you. The pieces are made..you have to fit them together. When it is me doing both the writing and the illustrating - I have to create the puzzle first and then cut it into pieces and then dump them out . . . and put them together. What projects are you working on now? Will we see more of LOUISE? Yes! Louise is now a series!! Book 2 is out 2015, 3 in 2016. There will also be readers where we go to school with Louise and are in art class with her classmates and art teacher. The most important thing I can tell anybody is to educate yourself on the industry, the editors, the art directors, the market and contemporaries . . . and then for get it all. Shut out what everyone else is doing, what everyone else is saying and listen to yourself and the kid inside you. Forget about who says what is in or out or right or wrong. Draw what needs to come out of your pencil. Only when you make something that is truly unique and from your heart...will you stand out. Kelly Light grew up down the shore surrounded by giant roadside dinosaurs, cotton candy colors and skee ball sounds. Schooled on Saturday morning cartoons and Sunday Funny pages, she picked up a pencil and started drawing and never stopped. Now living in New York, she is the author and illustrator of the picture book LOUISE LOVES ART as well as the illustrator of the two chapter books series, THE QUIRKS and ELVIS AND THE UNDERDOGS, the upcoming DON'T BLINK by Amy Krouse Rosenthal and JUST ADD GLITTER by Angela DiTerlizzi. Find her on the web at kellylight.com. Raise your hand if you would just love to peek into those three ring binders filled with Kelly's "treatments" from 2006 onward! Great interview! Thank you, Kelly and Kidlit411, for the fun interview and the giveaway! I LOVE that Kelly says, learn all you can about the industry, then 'forget it all' and 'write the story you want to read'. And I am with Cathy - let's sneak a peek! I love how you keep your 3 ring binders. So organized! I'm going to try this, as opposed to my "which book did I scribble that in?" approach. :) Very nice interview. Love this post! 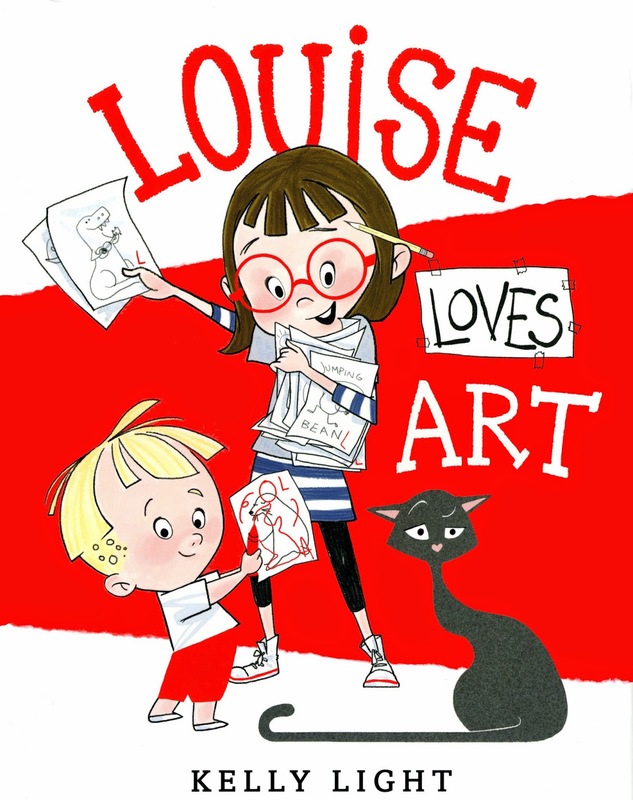 I just reserved Louise Loves Art at my library and can't wait to read it. Thanks for the post. I especially liked the part about writing something unique and from the heart. Wow, such a talent. So happy to see your career taking off Kelly!!! Thanks so much for the great insight into your work, Kelly! You're the best! I've been checking my big box store every time I go...can't wait to read this, Kelly, along with all of your other work. Thanks for allowing us to peek into your process. You are so talented. Thanks, KidLit 411 for featuring Kelly. Great interview! Yessss! Can't wait to get this book for my k-2 art room. I love Louise. She is both nerdy and fun! 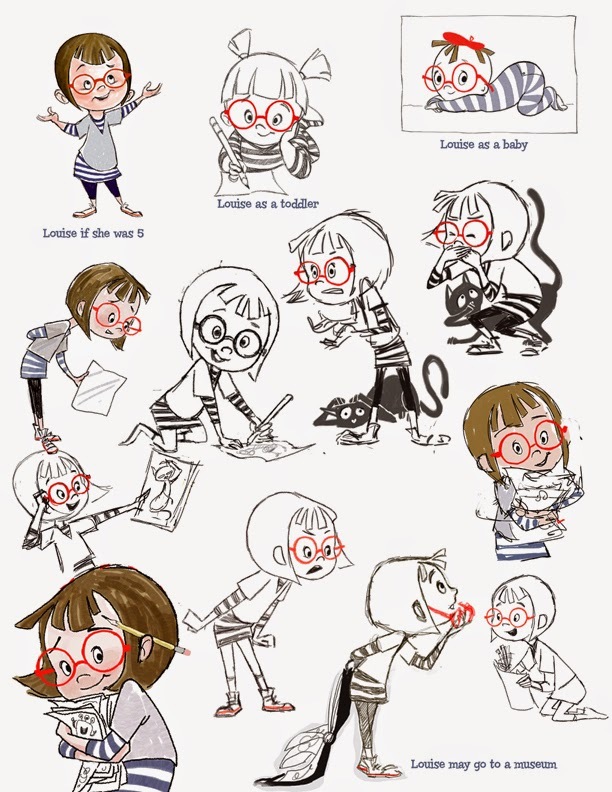 Cute illos! Congratulations Kelly and thanks for the great advice.